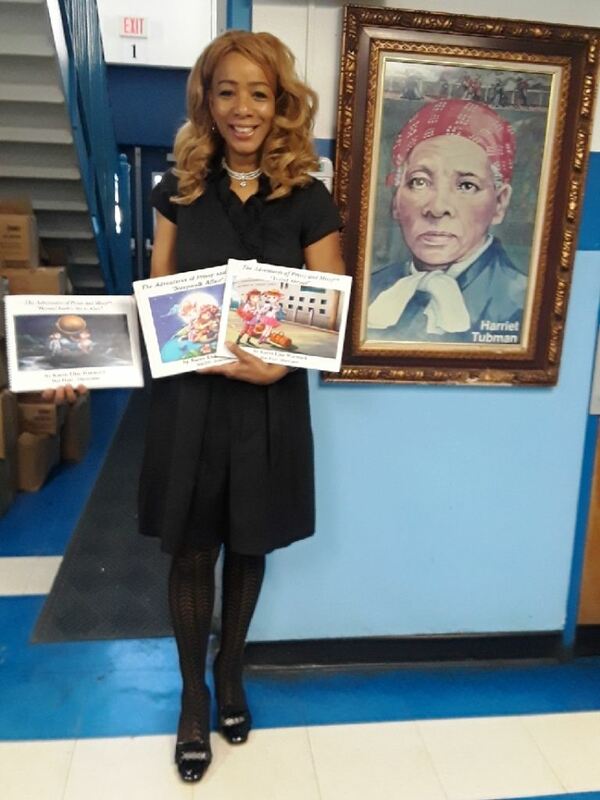 Karen Elise Wormack, Author Invited for Popular "Celebrity Read"
NEWARK, N.J. - Aug. 18, 2018 - PRLog -- Author Karen Elise Wormack is shown pictured with a portrait of Harriet Tubman, famous conductor of the "Underground Railroad" (1850 – 1860), found within the entrance corridor of Harriet Tubman Elementary School, 74 South 10th Street, Newark, NJ.. Wormack was an invited guest Author during a "Celebrity Read" event, sponsored by United Way of Essex and West Hudson Counties of NJ. Miss Tubman known throughout the world for her abolitionist service to slaves in America, has received honor and recognition, having her name inscribed on many public and private institutions within the USA. She was born in 1820, escaped from slavery in Maryland, and was referred to as the "Black Moses", having led more than three hundred runaway slaves to freedom in the North and Canada. Harriet Tubman died from pneumonia in Auburn, NY on March 10, 1913 at the age of ninety three. Prior to the abolition of slavery by President Abraham Lincoln, whose bust appears on the American five dollar bill, Harriet Tubman and many other brave slaves born from African parents or African mothers and slave owner fathers such as, Frederick Douglas, were engaged in the dangerous and illegal, albeit, courageous activity of secretly relocating portions of the black slave population from the deep South to Northern states and onward to Canada. History shares with us many details about the abhorrent treatment of black slaves by their American male and female Masters. We especially know that captured people and their offspring were not allowed to receive any form of education. This meant learning to read, write, think, use one's vibrant imagination, seek knowledge, information, understanding or wisdom was absolutely forbidden by law! The sole duty in the eyes of white slave owners for their human property's entire life's existence was to live in complete service to the Masters and doing so under the pretentious proclamation of the Divine God's blessings, including; hard labor, daily work and toil, financial destitution, disrespect and generational inferiority complexes, inconceivable suffering such as whippings and loss of life through hanging from a tree or shot gun, poor diets, close call starvation, a production line of free labor through the birth of plantation born children who were kept or sold for additional plantation cash revenue, as well as, embedded wide spread fear of family separation or death, among all black slaves. This fear was an ever looming threat garnering total and complete control of the mind and body of the Black slave population. Furthermore, as mentioned earlier, multitudes of children were born through the sexual activity of slave Masters with their female slave property. A now famous and publicly recorded relationship is that of the third President of the United States, Thomas Jefferson and his intimate relationship with female slave Sally Hemings. Children were conceived through this union. Descendents are alive today. Consequently, many extreme lies and twisting of real truth were heaped upon the already fragile psychological mindset of Black slaves in America. Daily mind control was an effective tool for mental and physical slavery incarceration. However, Harriet Tubman totally disagreed with this inhumane system and she was right. Miss Tubman was actually living and physically embodying Scripture each time she disobeyed the law by helping to free enslaved people, which says, "Let God be true and every man a liar." Therefore, Karen Elise Wormack, an African American Female Author, born in the United States of America believes Harriet Tubman would be extremely proud of her post graduate education, as well as, professional licenses and certificates, but especially her excellence in children's literature. The Adventures of Prissy and Missy™, books and brand are written for the girls, boys and people of the world, regardless of ethnicity or racial background. Prissy and Missy's distinct identity is that of being multi cultural cat girl twin sisters. Their fictional character representation is actually bi-racial or a diversification of DNA expressed through innate ancestry. Furthermore, although Wormack and her biological parents are African American, as with multitudes of people living in America, her blood line is mixed with Native American, Irish and Caucasian. She was born free to receive an education of reading, writing, and arithmetic, combined with creative, imaginative and analytical thinking skills. Wormack believes her writing ability is two parts education and two parts…gift….from God…who loves all people and was happy when slavery was abolished. Moreover, Prissy and Missy have hearts of gold and love everyone! Their experiences are easily relatable to children and adults alike. Prissy and Missy's stories are original, funny, engaging, rich in language and vocabulary, expressive, unique, wholesome and bright! The series of not less than fifteen titles will also have accompanying workbooks. The Adventures of Prissy and Missy™ book sales have transcended socio- economic and ethnic barriers evidencing their literary, marketing and historic value. In fact, there are thousands of Prissy and Missy friends and fans, over a five year period of constant "Community Learning and Literacy, Book Reading, Autographing and Elementary School and Library Events" with Patron Saints who acquire Prissy and Missy's books periodically for children in need. Yes, Harriet Tubman (who was not prejudice, having made myriads of friends with Quakers and other Caucasian people possessing, wisdom, compassion, expertise, authority, power, forward thinking and influence), would be proud to read The Adventures of Prissy and Missy™, written by a descendent of slaves. Sorrowfully speaking however, perhaps if Karen Elise Wormack, MPA was born during the era of slavery in the United States of America, most likely, The Adventures of Prissy and Missy, exciting and sophisticated children's book series, would never have seen….. the light of day….Thank God they did!